The general public’s image of a robot might still be the comical, futuristic android stereotype portrayed in the media. However, robots are actually now fairly commonplace in many modern industries. Manufacturers, in particular, have benefited from the widespread availability of industrial robots, which are currently in use in different types of applications. Industrial robots have been an extraordinary boon to manufacturing facilities that are dependent on automation. Because they can perform complicated automation processes precisely, at high speed, and continuously throughout long cycles without any breaks, industrial robots have helped increase output across many industries, heightening productivity all while maintaining product quality. These systems possess the distinct advantage of being composed of high-quality precision components like miniature motors for industrial automation, which provide high torque density, long-life, and high-efficiency to optimize the performance of the machines into which they are integrated. The use of industrial robots also tend to improve the general working conditions within the manufacturing plant, as robots can assume risky tasks or operate in dangerous environments, keeping human workers safely out of harm’s way. Industrial robots can be classified according to different criteria. These can, for instance, be classified according to their applications or the manufacturing processes they are used for—e.g. handling, palletizing, pick-and-place, and so on. They can also be grouped according to the type of movement or the degrees of freedom they accomplish. However, one of the most familiar ways to categorize these robots is according to these six types of configurations: articulated, Cartesian, cylindrical, polar, SCARA, and delta. How do each of these types vary in terms of speed, size, and workspace, and what respective manufacturing processes are they commonly used for? Here’s our list of quick and interesting definitions of each of these types of robots. In machine design, articulated robots are the type that possess rotary joints. An articulated robot can have anywhere from two simple joint structures to ten or more joints, and these joints are commonly arranged in a “chain” structure such that one joint supports another one further down in the chain. These joints are also referred to as axes, with each providing an additional degree of freedom or range of motion. Industrial robotic arms typically have four to six axes. They are employed in manufacturing processes such as gas and arc welding, paint application, and die-casting, among others. Also known as gantry or rectilinear robots, Cartesian robots operate with three linear joints along the Cartesian coordinate system. These three sliding joints linear motion along the XYZ axes. Though they require a tedious assembly process from several individual parts, Cartesian robots are highly sought out by plant operators because they’re flexible, easy to program, and customizable for factors such a stroke length and speed. They’re popular for automated manufacturing processes such as pick-and-place assembly and 3D printing. A cylindrical robot possesses two moving elements: the joint axis that it uses for rotational movement, and the prismatic joint that it uses for linear motion. These two movements transpire within a cylindrical-shaped work envelope, which some machine designers favor for their economy of space. The cylindrical robot is ideal for automated machining processes that are fairly simple, such as the handling of machine tools and spot welding. Polar robots, or spherical robots, utilize the axes of one rotational joint, two rotary joints, and one linear joint—or a polar coordinate system—to operate within a spherical-shaped work envelope. This type of industrial robot is also used for processes like handling machine tools and gas and arc welding, as well as for fettling machines. 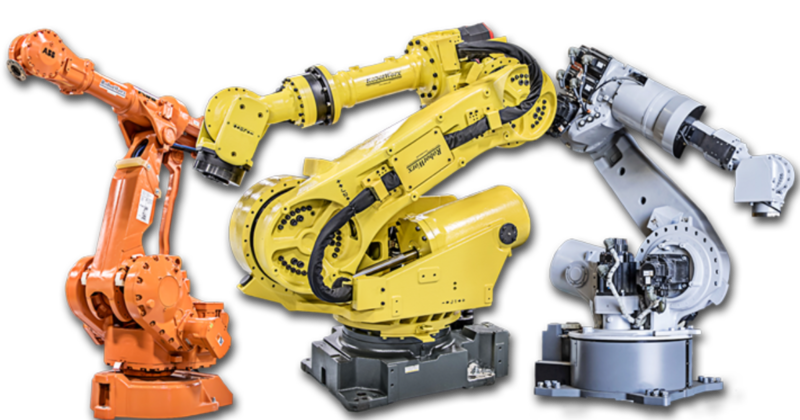 The acronym SCARA stands for “Selective Compliance Assembly Robot Arm.” This type of industrial robot features a pair of parallel joints that provide compliance in one selected plane. SCARA robots are regarded by machine designers as “all-in-one” types, as they come with XYZ and rotary motions in one ready-to-go package. The robot’s work envelope differs from that of cylindrical and Cartesian robots in that it has more degrees of motion in one radius or arch-shaped space. Flexible and configurable, SCARA robots bolster the assembly line, and appear in manufacturing plants for industries like biomedicine. The delta robot is unique because of its structure of jointed parallelograms connected to one common base, and its dome-shaped work envelope that is capable of very high speeds. They are the fastest and most expensive of the six types of industrial robots, and they can engage in quick pick-and-place applications with high precision. This type of robot can be found in the busy work environments of pharmaceutical and electronic manufacturing plants. Machine designers select among these different robot types for what they offer in terms of speed, precision, orientation, environment, and duty cycle, among other factors. Thus, choosing the type of industrial robot to employ in automated manufacturing processes is a matter of evaluating what type of job and workspace the robot will have, and what type of performance will be required of it. Once manufacturers determine the right robots for them, these “soldiers of automation” march right to their aid in keeping the plant productive, efficient, and profitable.